A new collaboration for Meals on Wheels and the Olde Forge Community Resource Centre! At the end of July we said goodbye to Algonquin College who are no longer able to provide meals for the Meals on Wheels program. We thank them for being a meal provider over this last year and half. In searching for a solution to find a meal provider to cover this area, we approached two of our current meal providers who were happy to step in to provide extra meals in support of our program. An extra hot meal route was added at St Patrick’s Home and three extra hot meal routes were added on at The Good Companions . Many thanks to these two great partners! We then forged a new relationship with The Olde Forge Community Resource Centre who agreed to act as a depot location for extra meals being prepared by The Good Companions for delivery in the west end. These meals are being transported from The Good Companions for pick up by delivery volunteers from the Olde Forge. The Olde Forge Community Resource Centre is a non-profit, charitable organization run by a handful of staff and a dedicated corps of volunteers. 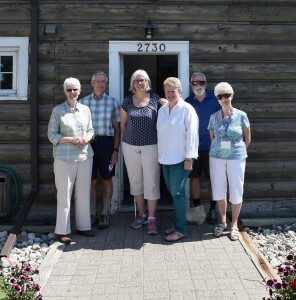 Located at the junction of Carling Avenue and Richmond Road in a heritage log building, the Olde Forge provides an information and referral service to the community at large and a community support program to seniors and adults with physical disabilities living in the west end of Ottawa. Given our common goal of supporting seniors and adults with disabilities we are a great fit to embark on this new collaboration together. Thank you to Sue Walker, Executive Director of the Olde Forge for working with us to support our clients. Currently the Meals on Wheels staff are busy transporting these meals from the Good Companions Centre to the Olde Forge but will be looking to recruit volunteers to take on this role. If you are interested in volunteering as the Meals on Wheels Volunteer Depot Coordinator, you can see the position description here. Contact us if you are interested in this position at jill@mealsonwheels-ottawa.org or by calling 613-233-2424.